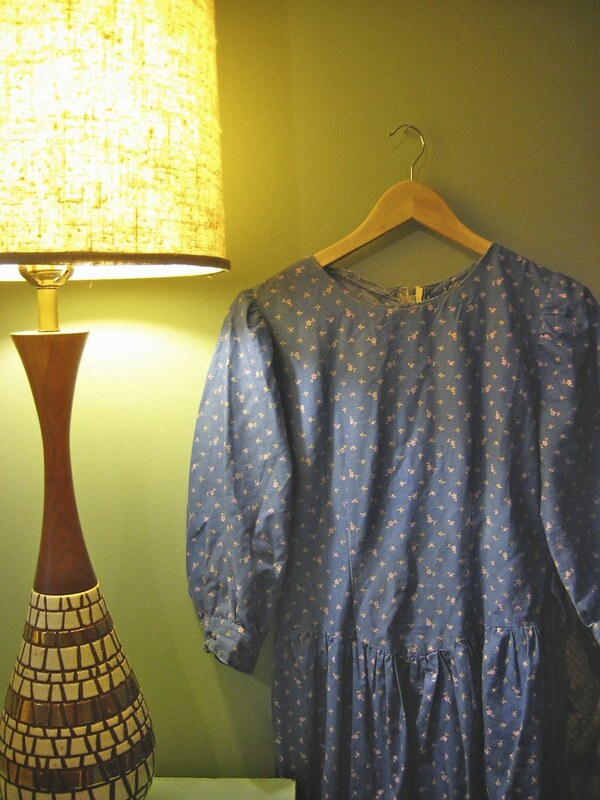 As you may know, I've been talking up my first handmade dress project for about a month. Well, this week I've taken steps towards starting it. 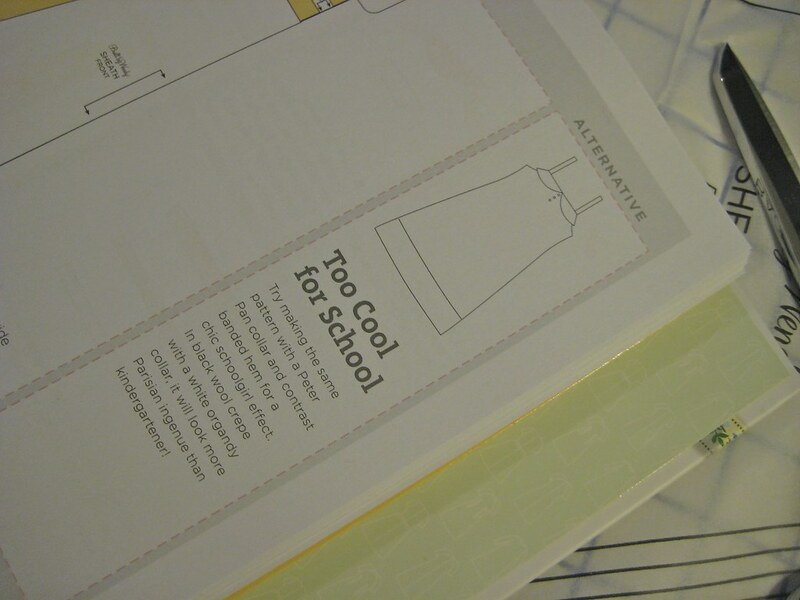 Actual, you know, sewing, has yet to happen. Maybe it's my fear of messing it up that's putting it off, maybe it's a bit of overzealous caution. At any rate, I'm covering all my bases before diving in and making the first cut.. I've chosen the pattern and its variation, and - I have a clean workspace. 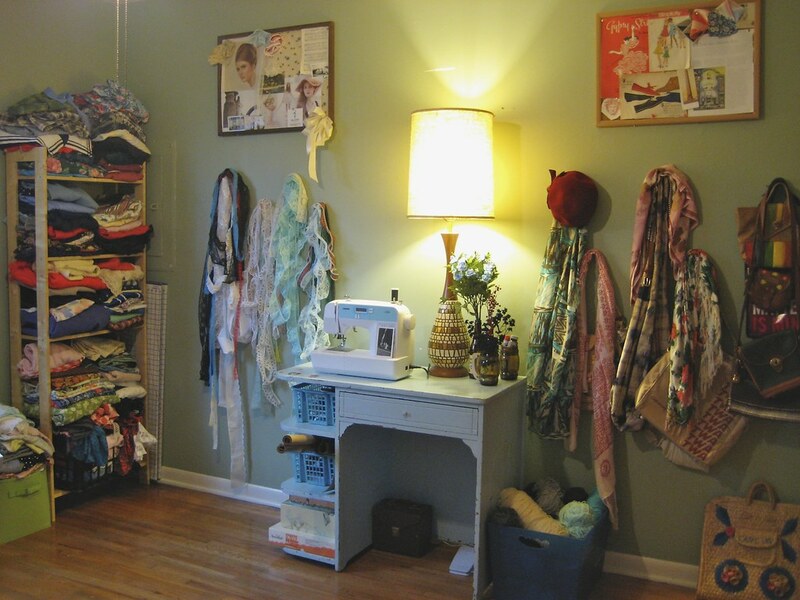 Here is what my sewing space looked like before.. I retired my old desktop computer to our attic (sad day for me, but it's for the best.. that's my old school computer game PC) and moved my sewing machine from its small table in the corner to the much larger desk. It'll be nice to actually have room for the garments I'm sewing, now! The green box filled with folded clothes next to the tall shelf on the left is designated for projects I'm currently working on. 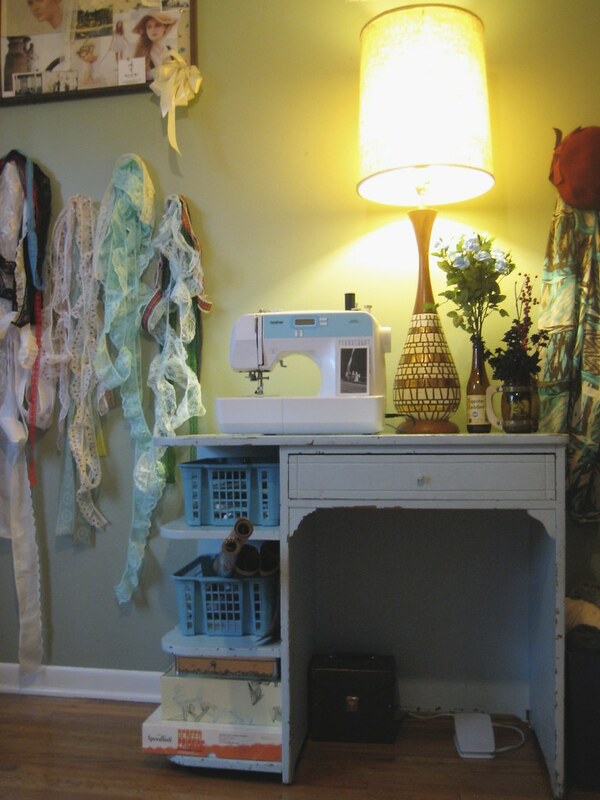 I organized all of my shop items as well as my fabric and consolidated them into the shelving unit on the left. I also stowed away my sewing knick knacks into a couple of baskets (sewing pieces in one, packaging supplies in the other), and I used two shoeboxes I love (the great UO ones that slide open) for other assorted items - one for hair pin supplies, another for random items like glue gun sticks. Wow, it feels good to actually know where things are. I can't tell you how often I've bought supplies I ended up not needing just because things were hidden in a messy pile. My favorite project was super simple and easy. I love all of the lace I've accumulated, so I wanted to display it somehow.. solution? I stuck four nails in the wall and used them to hang my lace up! I also used a pretty (and clean!) beer bottle and some old thrift store mugs to store flowers and craft supplies on the desk. And the lamp is a 1970's find from an Illinois thrift store a few years back, for five dollars. 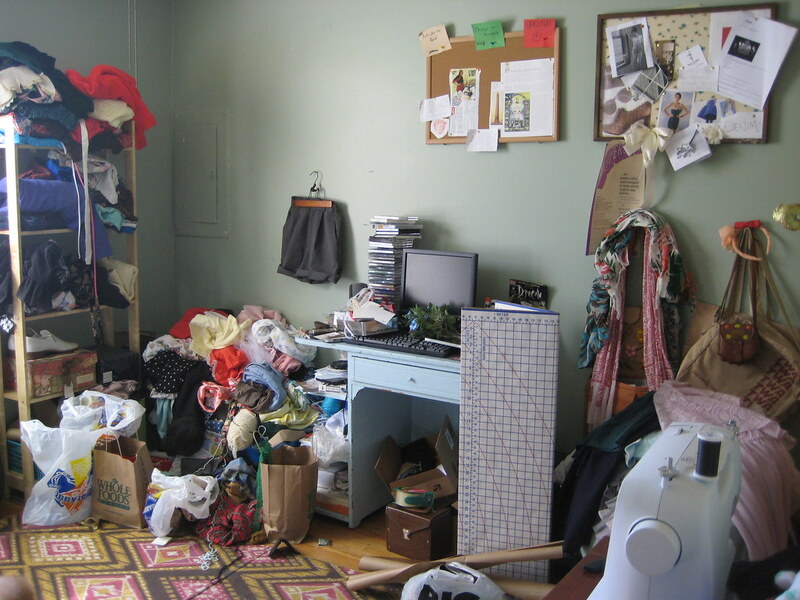 Actually.. nearly everything in my sewing room is secondhand. The desk belonged to my friend's little sister, who gussied it up in that great mint green hue and some colorful stickers (there are yellow stenciled stars on the back side that I'm sure you're dying to see). The majority of my fabrics are vintage. 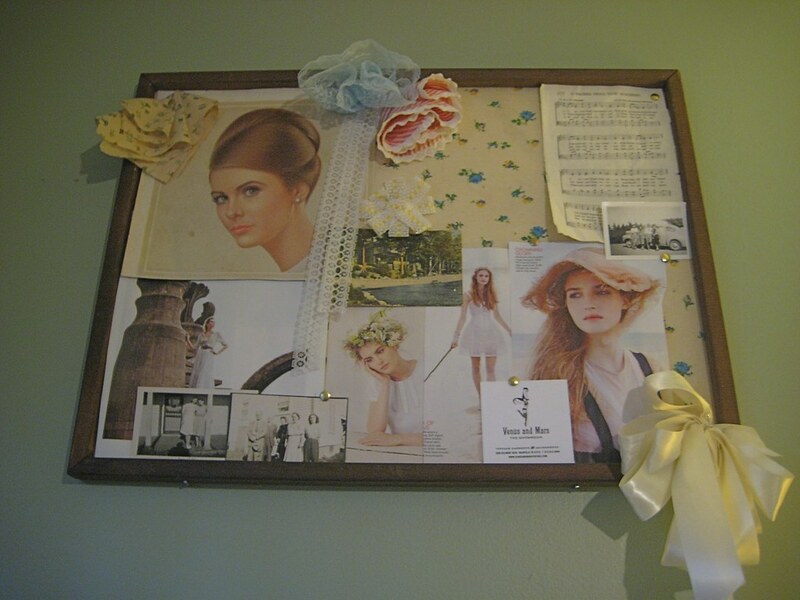 The floral bulletin board was found at a thrift store back in my college town. The green baskets were stolen from my sisters at one point during childhood.. does that count as secondhand? Thanks for all of your pattern suggestions from a couple of weeks ago! Here is the pattern I've decided to try. Ultimately, I went with the overall jumper because of its versatility. Since I'm using a brown liberty print broadcloth, I can ideally wear this garment in the fall as easily as I can wear it in the summer or springtime. Because of this, I chose the pattern without long sleeves (like American Pastoral, which was probably my favorite) and without the summery breeziness of the Capri Sundress. And since it's a jumper.. well, it's built for layering, which means a tank top in the summer, a long sleeved Victorian-style blouse in the fall. 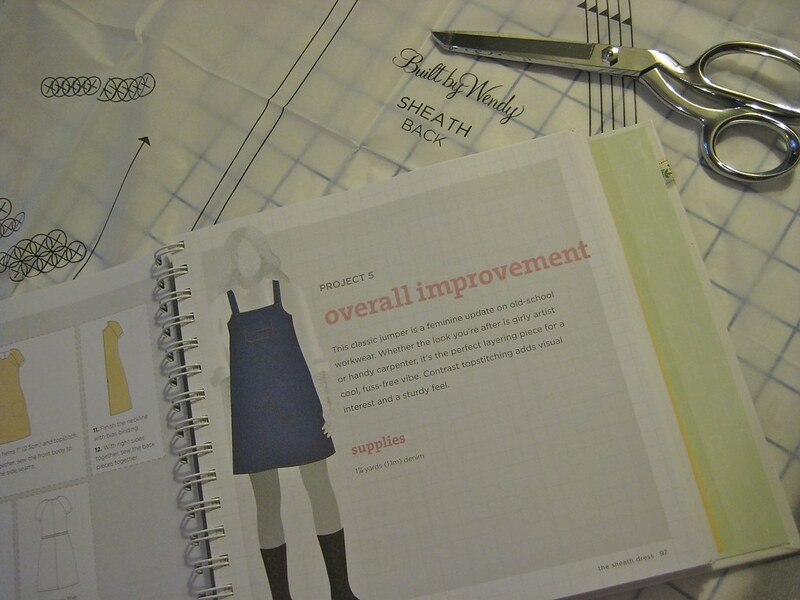 I'm also using the pattern's variation - skipping the pocket and adding a peter pan collar. Let's face it, what dress couldn't use a peter pan collar? Expect some progress (and some actual sewing) next Sewing Saturday! I also wanted to thank all of you that have showed me your versions of the past two projects I've made.. what a wonderful feeling to know you guys are using my sewing ideas! I've especially loved seeing photos of the shorts you all have made from thrift store finds. Looking at how lovely they turn out, it's a wonder there are still girls out there that pay a fortune for new ones. Here's a sneak peak of the loveliest liberty print dress I've ever seen. I spotted it in Jessica's beautiful Etsy shop, and we made a vintage trade! I'll be shortening the skirt a bit and wearing it for a fun blogger meet up I have planned for this week, probably with black tights and heels.. more soon!